Old Synagogue - vacated - Saint John, New Brunswick. Chabad of Centrepointe is a Chabad center which also functions as a synagogue. Congregation Lubavitch is located at Chabad-Lubavitch of Ottawa, 889 Lady Ellen Place in Ottawa. Adath Israel Poale Tzedek - Anshei Ozeroff Congregation, Hampstead, Quebec, Outremont (1930-1981),Hampstead (1981–present).Merged with Poale Zedek in 1985, and Anshei Ozeroff in 2003 (officially in 2008). Congregation B'nai Jacob (1902), Cadieux Street, Montreal, designed by Eric Mann. Jewish People's School (1940), Waverley Street (Montreal), designed by Reuben Fisher and Max W. Roth. Beth Jacob Synagogue - Pearl and Max B. Herman Centre. Regina, SKsynagogue designed by Francis Henry Portnall in 1949. ^ "Dictionary of Architects in Canada". Retrieved November 16, 2011. ^ "Am Shalom Congregation". Retrieved February 12, 2018. ^ "Interactive Museum of Jewish Montreal". Retrieved December 27, 2012. 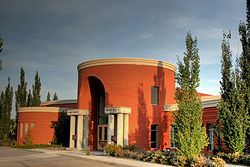 ^ The Encyclopedia of Saskatchewan: The Beth Jacob Jewish Community. 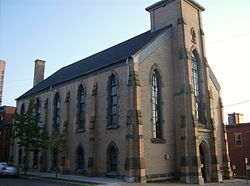 Wikimedia Commons has media related to List of synagogues in Canada. This page was last edited on 29 January 2019, at 04:32 (UTC).